AtlasMap is a data mapping solution with an interactive web based user interface. It simplifies configuration of an integration that handles different types of data represented by XML schema or instance files, JSON schema or instance files or Java class files. 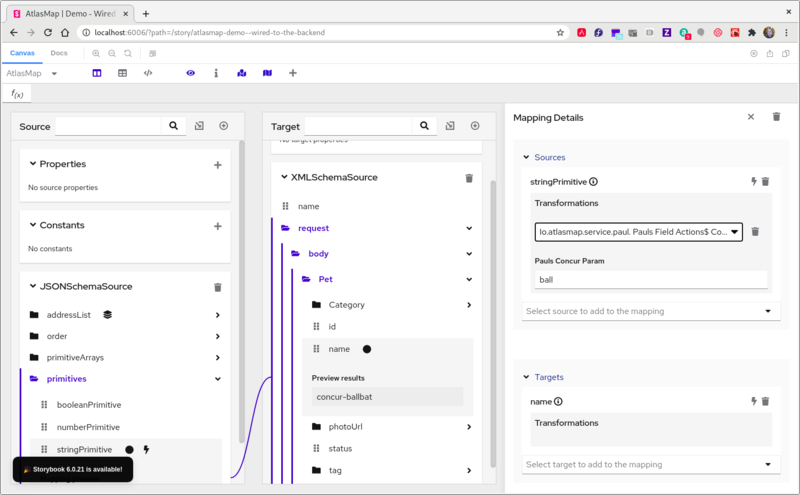 You design your data mapping and transformations in the AtlasMap Data Mapper UI canvas, and then execute that mapping by means of the AtlasMap runtime engine. We provide standard transformations or we support custom, user-defined transformations. We also have a camel-atlasmap component which consumes an AtlasMap mapping definition which can process data mappings as a part of a Camel route. Here is the shortest path to run standalone AtlasMap. Now AtlasMap Data Mapper UI is available at http://127.0.0.1:8585/ The .adm file can be created with the export icon on the main toolbar. camel-atlasmap endpoint use IN body as a default source document of mappings. If IN body is a java.util.Map, key is used as a Document ID and corresponding value is used as a Document payload. Data mapping fundamentally involes morphing one data shape into another. A user defines these shapes using XML schemas, JSON notation or by establishing a simple Java class. The following sections examine each file type independently. To import this file into the AtlasMap Source panel, select the import icon at the top of the panel. An Open File dialog appears. Select the location for the JSONSchema.json file. The fields now appear in the Source panel as you defined them in the imported JSON schema. Now consider the import an XML schema into the Target panel. In the data mapper, click the import icon at the top of the Target panel. An Open File dialog appears. Navigate to the XMLSchema.xml file and select it. The fields now appear in the Target panel as you defined them in the imported XML schema. The fields are expanded to show more detail. Using the same procedure as before, import instance files into either the Source or Target panel. Import the file into AtlasMap. Select the import icon on the main tool bar, not on the panel. An Open File dialog appears. Navigate to the Bicycle.jar file and select it. Select the plus icon (+) on the Source or Target panel. A dialog appears "Establish your class in the Sources panel." In the Class package name: input field, enter the class package name of the Java class you have defined. In the Bicycle.jar example, the class package name is io.paul.Bicycle. You will now see the fields you created in your Java class file appear in the selected panel. You have now defined the source and target data shapes. In a relatively simple integration, mapping data fields is easy and intuitive. 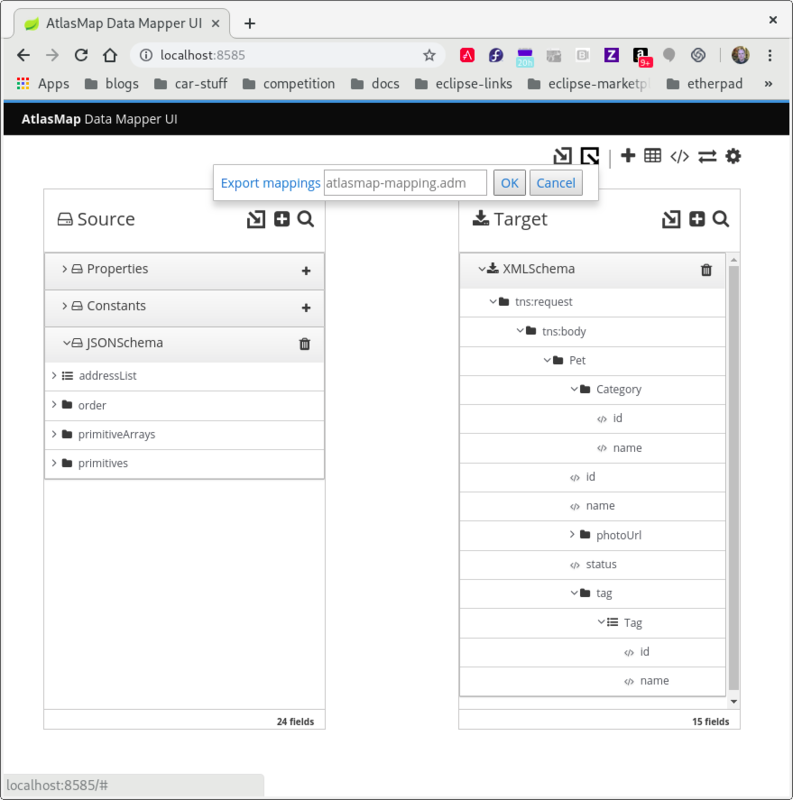 In more complex integrations or in integrations that handle large sets of data fields, mapping from source to target is easier when you have some background about how to use the data mapper. 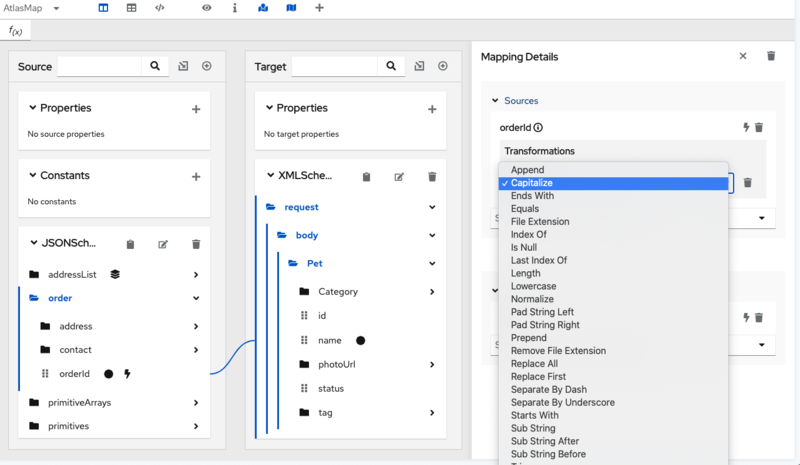 Sources is a list of the data fields that you can map to target fields. 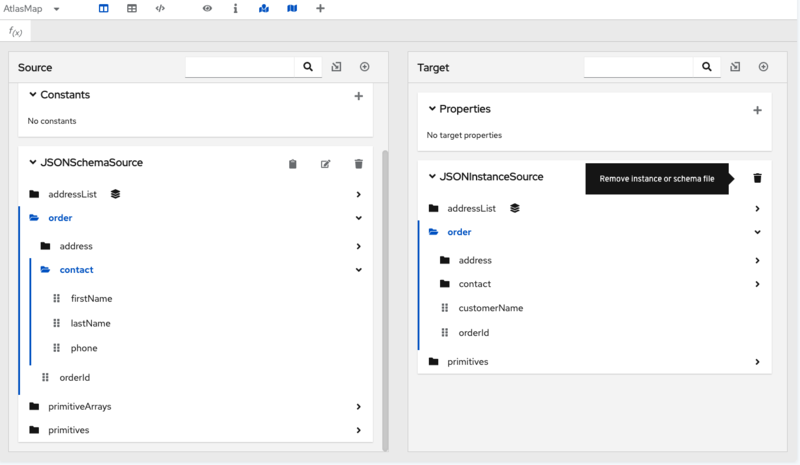 Target is a list of the data fields that you can map source fields to. The Sources panel and the Target panel each have a search field at the top. If the search field is not visible, click at the top right of the Sources or Target panel. Enter the names of the fields that you want to map. To do this, in the upper right of the Configure Mapper page, click the plus sign to display the Mapping Details panel. In the Sources section, enter the name of the source field. In the Action section, accept the default Map, which maps one field to one other field. Or, select Combine or Separate. In the Target section, enter the name of the field that you want to map to. Expand and collapse folders to limit the visible fields. The default mapping behavior maps one source field to one target field. For example, map the Name field to the CustomerName field. In the Sources panel, click the data field that you want to map from. You might need to expand a folder to see the data fields that it provides. When there are many source fields, you can search for the field of interest by clicking the and entering the name of the data field in the search field. In the Target panel, click the data field that you want to map to. The data mapper displays a line that connects the two fields that you just selected. Optionally, preview the data mapping result. This is useful when you add a transformation to the mapping or when the mapping requires a type conversion. 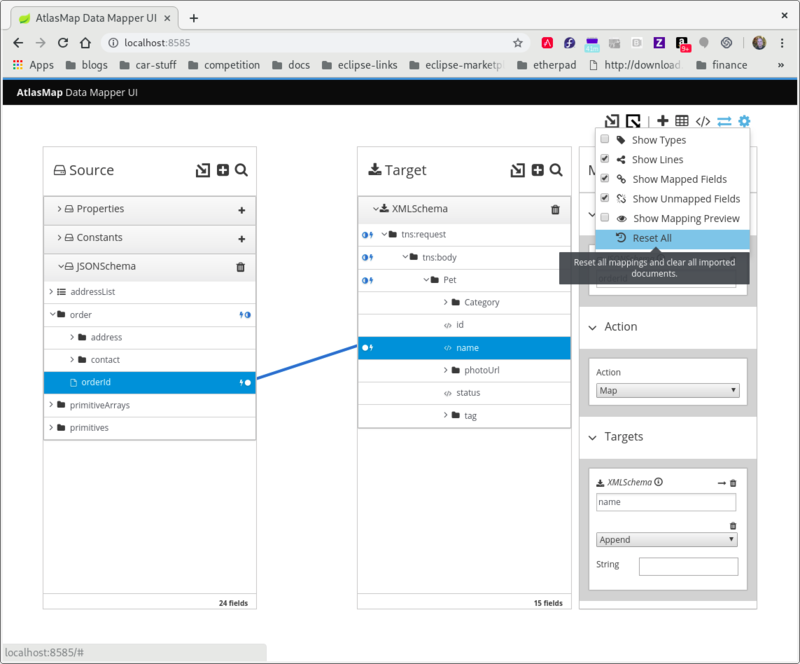 In the upper right of the data mapper, click and select Show Mapping Preview to display a text input field on the source field and a read-only result field on the target field. In the source field’s data input field, enter text. Click somewhere outside this text box to display the mapping result in the read-only field on the target field. 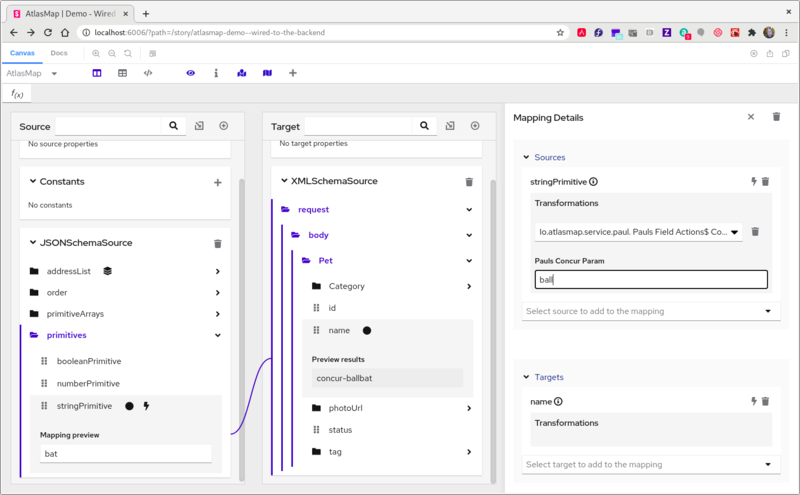 Optionally, to see the result of a transformation, add a transformation in the Mapping Details panel. Hide the preview fields by clicking again and selecting Show Mapping Preview. Optionally, to confirm that the mapping is defined, in the upper right, click to display the defined mappings. You can also preview data mapping results in this view. If preview fields are not visible, click and select Show Mapping Preview. Enter data as described in the previous step. In the table of defined mappings, preview fields appear for only the selected mapping. To see preview fields for another mapping, select it. Click again to display the data field panels. In the upper right, click Done to save the mapping. In the Configure Mapper page, in the upper right, click the plus sign to display the Mapping Details panel. In the Sources section, enter the name of the source field. In the Action section, accept the default Map action. In the Target section, enter the name of the field that you want to map to and click Enter. Suppose that you want to separate the long_address field into discrete fields for number, street, city, state, and zip. To do this, you select long_address as the source field and then select the target fields. You then add padding fields at the locations for the parts of the source field that you do not want. In this example, the unwanted parts are apartment, zip+4, and country. In the data mapper, to identify apartment, zip+4, and country as missing, you add padding fields at indexes 3, 7, and 8. See Separate one source field into multiple target fields. Now suppose that you want to combine source fields for number, street, city, state, and zip into a long_address target field. Further suppose that there are no source fields to provide content for apartment, zip+4, and country. In the data mapper, you need to identify these fields as missing. Again, you add padding fields at indexes 3, 7, and 8. See Combine multiple source fields into one target field. In a data mapping, you can combine multiple source fields into one compound target field. For example, you can map the FirstName and LastName fields to the CustomerName field. For the target field, you must know what type of content is in each part of this compound field, the order and index of each part of the content, and the separator between parts, such as a space or comma. See Example of missing or unwanted data when combining or separating fields. In the Target panel, click the field into which you want to map more than one source field. 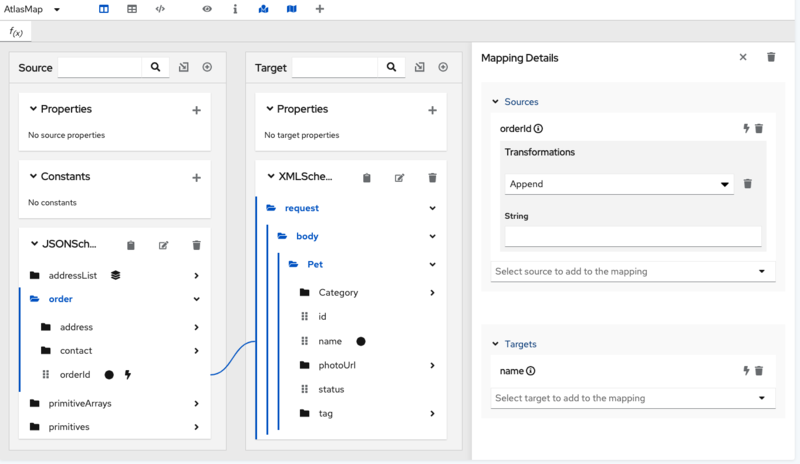 In the Sources panel, if there is a field that contains the fields that you want to map to the target field, then click that container field to map all contained fields to the target field. To individually select each source field, click the first field that you want to combine into the target field. For each of the other fields that you want to combine into the target field, hover over that field, and press CTRL-Mouse1 (CMD-Mouse1 on MacOS). The data mapper automatically changes the field action from Map to Combine. When you are done you should see a line from each of the source fields to the target field. 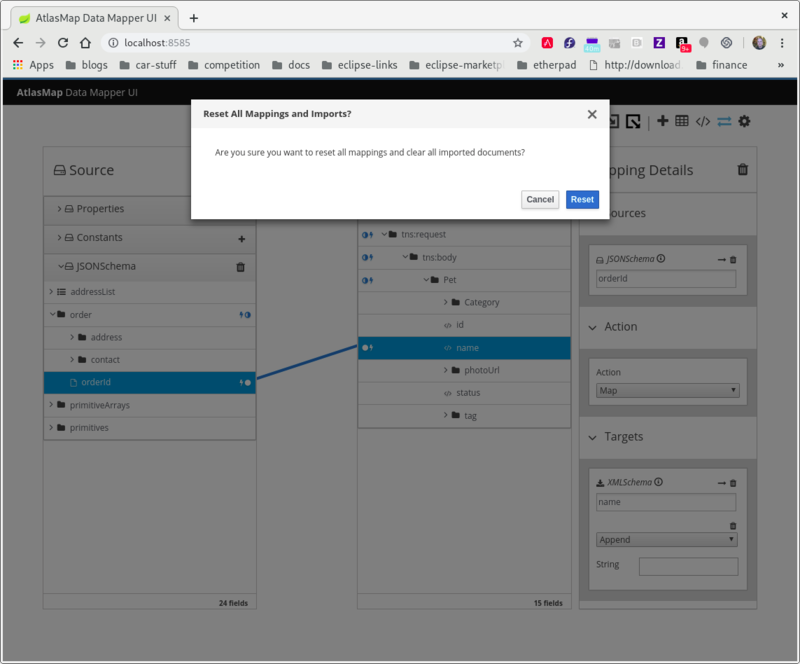 In the Mapping Details panel, in the Separator field, accept or select the character that the data mapper inserts in the target field between the content from different source fields. The default is a space. 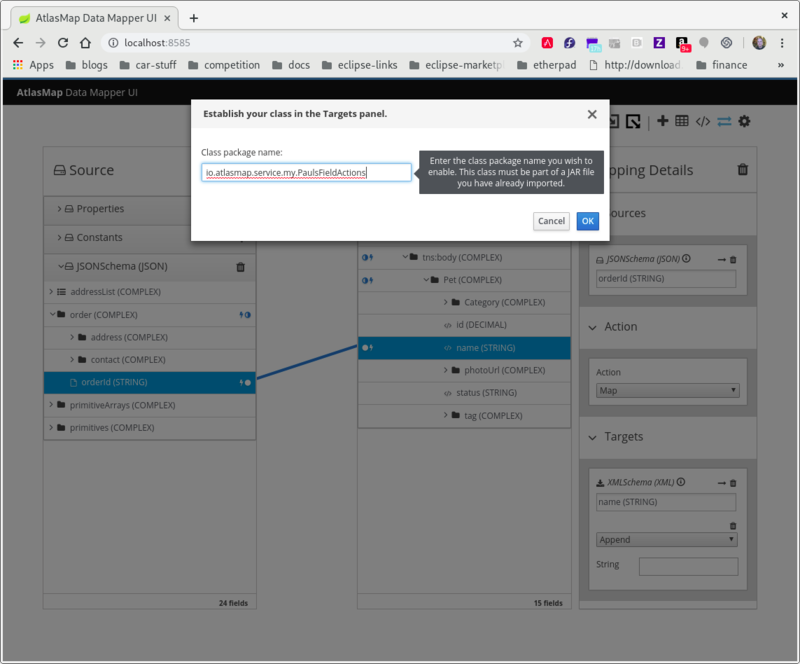 In the Mapping Details panel, under Sources, ensure that the source fields are in the same order as the corresponding content in the compound target field. If necessary, drag and drop source fields to achieve the same order. The data mapper automatically updates the index numbers to reflect the new order. If you mapped a source field to each part of the compound target field, then skip to the next step. If the target field expects data that is not available to be mapped, then in the Mapping Details panel, edit the index of each source field so that it is the same as the index of the corresponding data in the compound target field. The data mapper automatically adds padding fields as needed to indicate missing data. If you accidentally create too many padding fields, click the trash icon on each extra padding field to delete it. In the upper right of the data mapper, click and select Show Mapping Preview to display a text input field on each source field for the currently selected mapping and a read-only result field on the target field of the currently selected mapping. In the source data input fields, enter text. Click outside the text box to display the mapping result in the read-only field on the target field. If you reorder the source fields or add a transformation to the mapping then the result field on the target field reflects this. If the data mapper detects any errors, it displays informative messages at the top of the Mapping Details panel. If you redisplay the preview fields, any data that you entered in them is still there and it remains there until you exit the data mapper. To confirm that the mapping is correctly defined, in the upper right, click to display the defined mappings. A mapping that combines the values of more than one source field into one target field looks like this: . You can also preview mapping results in this view. Click , select Show Mapping Preview, and enter text as described in the previous step. Preview fields appear for only the selected mapping. Click another mapping in the table to view preview fields for it. In a data mapping, you can separate a compound source field into multiple target fields. For example, map the Name field to the FirstName and LastName fields. For the source field, you must know what type of content is in each part of this compound field, the order and index of each part of the content, and the separator between parts, such as a space or comma. See Example of missing or unwanted data when combining or separating fields. In the Sources panel, click the field whose content you want to separate. In the Target panel, click the first field that you want to separate the source field data into. 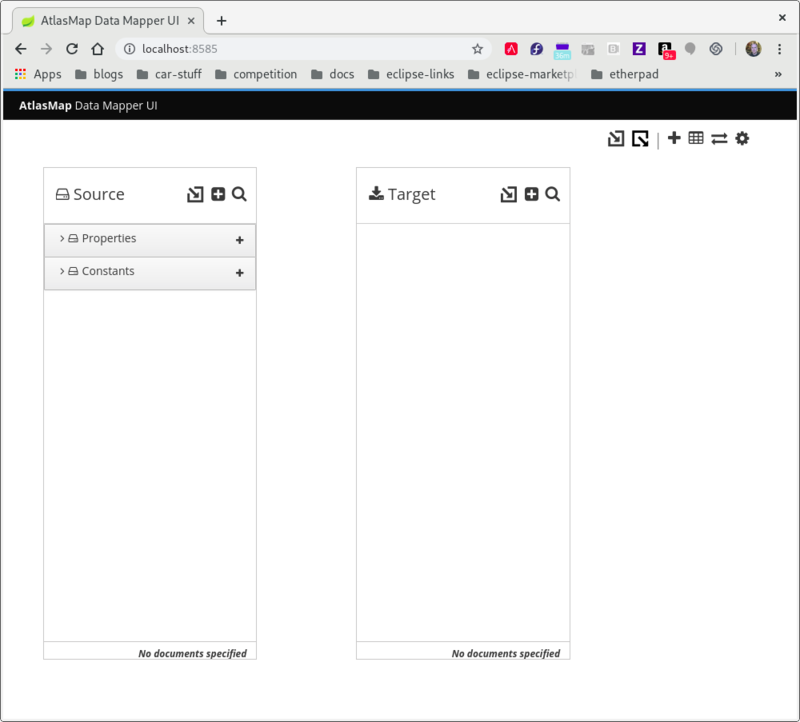 In the Target panel, for each additional target field that you want to contain some of the data from the source field, hover over the field and press CTRL-Mouse1 (CMD-Mouse1 on MacOS) to select it. The data mapper automatically changes the field action to Separate. When you are done selecting target fields, you should see lines from the source field to each of the target fields. In the Mapping Details panel, in the Separator field, accept or select the character in the source field that indicates where to separate the source field values. The default is a space. 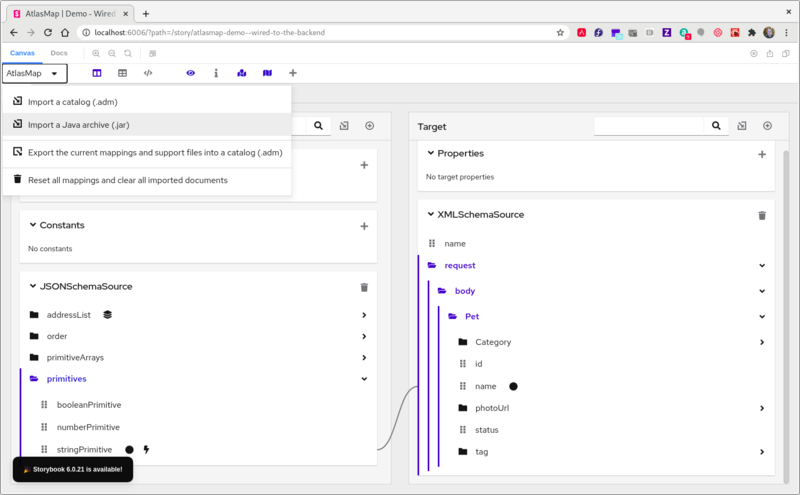 In the Mapping Details panel, under Targets, ensure that the target fields are in the same order as the corresponding content in the compound source field. If necessary, drag and drop target fields to achieve the same order. The data mapper automatically updates the index numbers to reflect the new order. If you mapped each part of the compound source field to a target field, then skip to the next step. If the source field contains data that you do not need, then in the Mapping Details panel, edit the index of each target field so that it is the same as the index of the corresponding data in the compound source field. 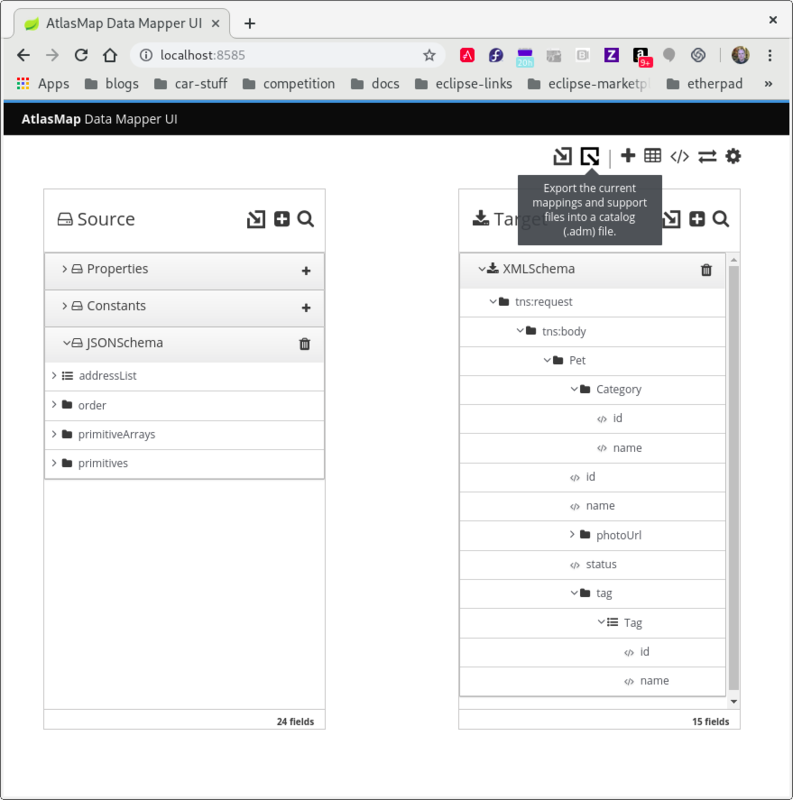 The data mapper automatically adds padding fields as needed to indicate unwanted data. 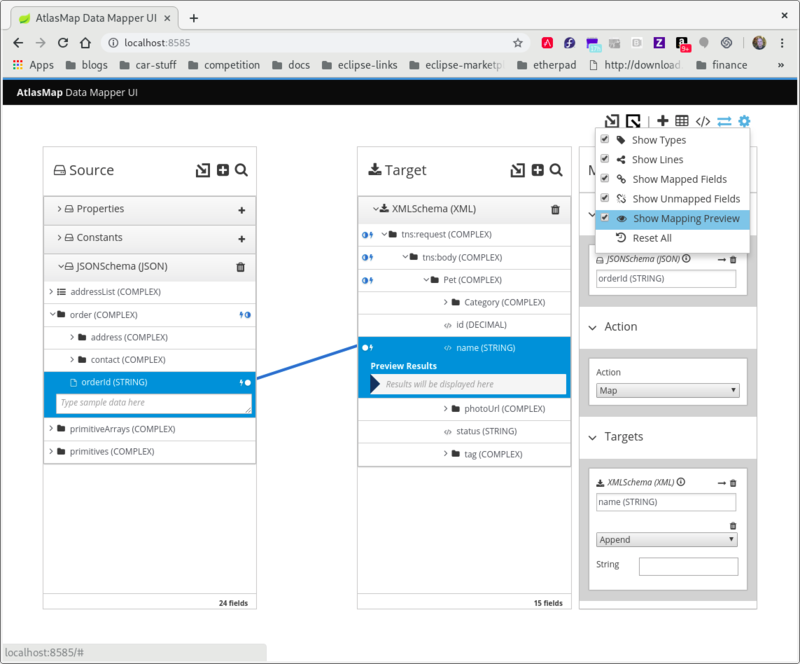 In the upper right of the data mapper, click and select Show Mapping Preview to display a text input field on the source field and read-only result fields on each target field. In the source field’s data input field, enter text. Be sure to enter the separator character between the parts of the field. Click outside the text box to display the mapping result in the read-only fields on the target fields. If you reorder the target fields or add a transformation to a target field then the result fields on the target fields reflect this. If the data mapper detects any errors, it displays informative messages at the top of the Mapping Details panel. To confirm that the mapping is correctly defined, click to display defined mappings. A mapping that separates the value of a source field into multiple target fields looks like this: . In the data mapper, after you define a mapping, you can transform any field in the mapping. Transforming a data field defines how you want to store the data. For example, you could specify the Capitalize transformation to ensure that the first letter of a data value is uppercase. Map the fields. This can be a one-to-one mapping, a combination mapping, or a separation mapping. In the Mapping Details panel, under Sources or under Targets, in the box for the field that you want to transform, click the arrow to the left of the trash can icon. This displays a pull-down where you can select the transformation that you want the data mapper to perform. Note that the set of available transformations is type specific. Click the transformation that you want to perform. If the transformation requires any input parameters, specify them in the appropriate input fields. To add another compound transformation, click the arrow to the left of the trash can icon again. Build your Java archive file. The io.atlasmap.v2, io.atlasmap.api and io.atlasmap.spi target dependencies are most easily resolved through the use of a maven pom.xml file. Use the same version number as the AtlasMap standalone JAR that you previously downloaded. Import your Java archive file. Click the import icon at the top of the AtlasMap main tool bar. Navigate to the JAR file containing your custom field action and select it. Select the plus icon (+) to enable the class within your field action JAR file. A dialog appears "Establish your class in the Sources panel." In the Class package name: input field, enter the class package name of the Java class you have defined for your custom field action. In the MyFieldAction.jar example, the class package name is io.atlasmap.service.my.PaulsFieldActions. Select the pull-down menu in the Targets window within the Mapping Details section. You will notice that your custom field action now appears as a selectable field action transformation. Select it. Test your custom field action. Select the icon on the AtlasMap main tool bar. Check the checkbox for Show Mapping Preview. In the Source panel there will exist an input field. Type a string into it (for example test). Now focus your cursor in the Preview Results field in the Target panel. You will see the same string. 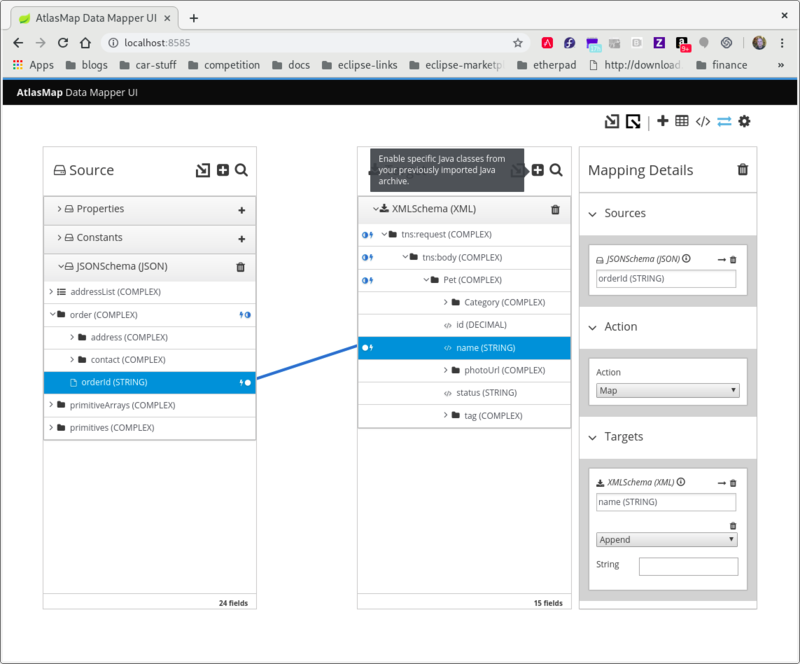 While you are using the data mapper UI, you can view the mappings that are already defined. This lets you check whether the correct mappings are in place. The data mapper canvas is visible. In the upper right, click to display a list of the defined mappings. To dismiss the list of mappings and redisplay the source and target fields, click again. The following table describes the available transformations. The date and number types refer generically to any of the various forms of these concepts. That is, number includes, for example, integer, long, double. Date includes, for example, date, Time, ZonedDateTime. Add days to a date. The default is 0 days. Add seconds to a date. The default is 0 seconds. Append a string to the end of a string. The default is to append nothing. Convert a phrase to a camelized string by removing whitespace, making the first word lowercase, and capitalizing the first letter of each subsequent word. Capitalize the first character in a string. Return the whole number ceiling of a number. Return true if a field contains the specified value. Convert a number that represents an area to another unit. For the fromUnit and toUnit parameters, select the appropriate unit from the From Unit and To Unit menus. The choices are: Square Foot, Square Meter, or Square Mile. Convert a number that represents a distance to another unit. For the fromUnit and toUnit parameters, select the appropriate unit from the From Unit and To Unit menus. The choices are: Foot, Inch, Meter, Mile, or Yard. Convert a number that represents mass to another unit. For the fromUnit and toUnit parameters, select the appropriate unit from the From Unit and To Unit menus. The choices are: Kilogram or Pound. Convert a number that represents volume to another unit. For the fromUnit and toUnit parameters, select the appropriate unit from the From Unit and To Unit menus. The choices are: Cubic Foot, Cubic Meter, Gallon US Fluid, or Liter. Return the current date and time. Return the day of the week (1 through 7) that corresponds to the date. Return the day of the year (1 through 366) that corresponds to the date. Return true if a string ends with the specified string, including case. Return true if a field is equal to the specified value, including case. From a string that represents a file name, return the file extension without the dot. Return the whole number floor of a number. In template, replace each placeholder (such as %s) with the value of the input field and return a string that contains the result. This is similar to mechanisms that are available in programming languages such as Java and C.
Create a string that represents a random UUID. In a string, starting at 0, return the first index of the specified string. Return -1 if it is not found. Return true if a field is null. In a string, starting at 0, return the last index of the specified string. Return -1 if it is not found. Return the length of the field, or -1 if the field is null. Replace consecutive whitespace characters with a single space and trim leading and trailing whitespace from a string. Insert the character supplied in padCharacter at the beginning of a string. Do this the number of times specified in padCount. Insert the character supplied in padCharacter at the end of a string. Do this the number of times specified in padCount. Prefix string to the beginning of a string. the default is to prepend nothing. In a string, replace all occurrences of the supplied matching string with the supplied newString. The default newString is an empty string. In a string, replace the first occurrence of the specified match string with the specified newString. The default newString is an empty string. Return the rounded whole number of a number. Replace each occurrence of whitespace, colon (:), underscore (_), plus (+), and equals (=) with a hyphen (-). Replace each occurrence of whitespace, colon (:), hyphen (-), plus (+), and equals (=) with an underscore (_). Return true if a string starts with the specified string (including case). Retrieve a segment of a string from the specified inclusive startIndex to the specified exclusive endIndex. Both indexes start at zero. startIndex is inclusive. endIndex is exclusive. The default value of endIndex is the length of the string. Retrieve the segment of a string after the specified match string from the specified inclusive startIndex to the specified exclusive endIndex. Both indexes start at zero. The default value of endIndex is the length of the string after the supplied match string. Retrieve a segment of a string before the supplied match string from the supplied inclusive startIndex to the supplied exclusive endIndex. Both indexes start at zero. The default value of endIndex is the length of the string before the supplied match string. Trim leading and trailing whitespace from a string. Trim leading whitespace from a string. Trim trailing whitespace from a string. Once it is clicked, an Export mappings dialog appears. 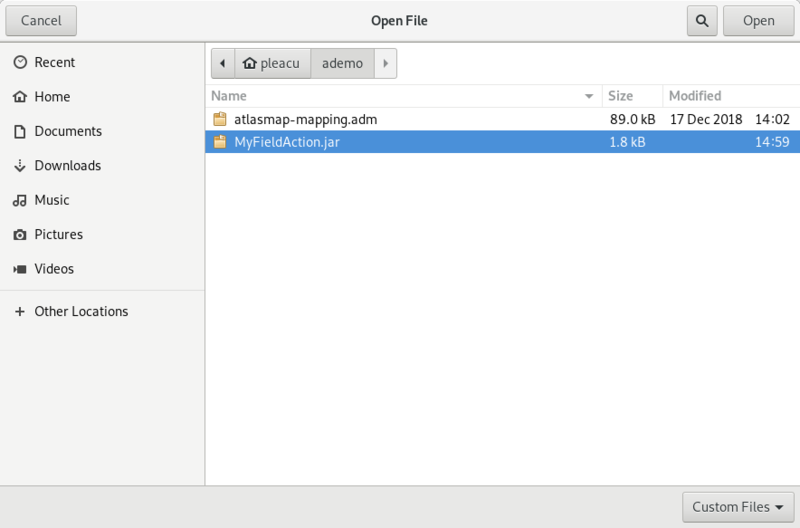 A standard default name for the ADM file appears as a placeholder (atlasmap-mapping.adm). You may override that file name as desired. Once you click the OK button the catalog file will be written with the specified name to the local Downloads directory. If a user wishes to remove all imported files as well as all mappings then select the icon on the AtlasMap main tool bar and select Reset All from the pull down menu. A challenge dialog will appear to verify that the user wants to remove all files. Once the Reset button is clicked AtlasMap is reset and the user is presented with a fresh blank canvas.